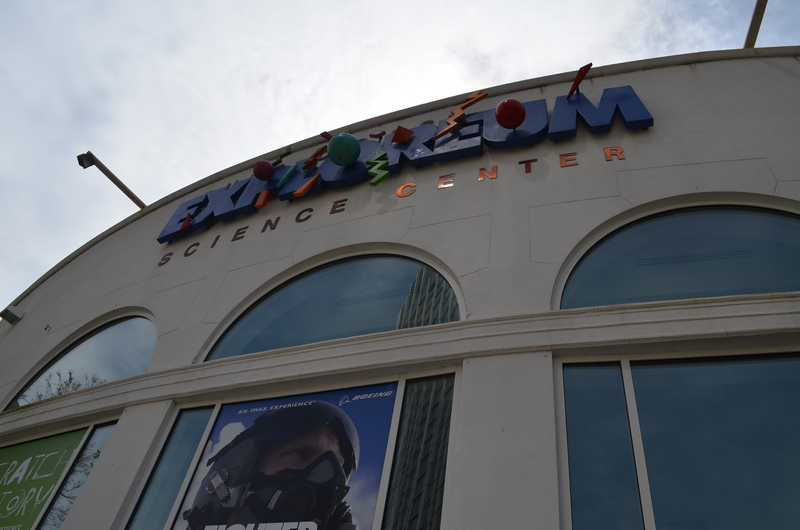 The Gulf Coast Exploreum is in a primo location in the heart of downtown Mobile. We enjoyed the museum, but it appears to need some updates. 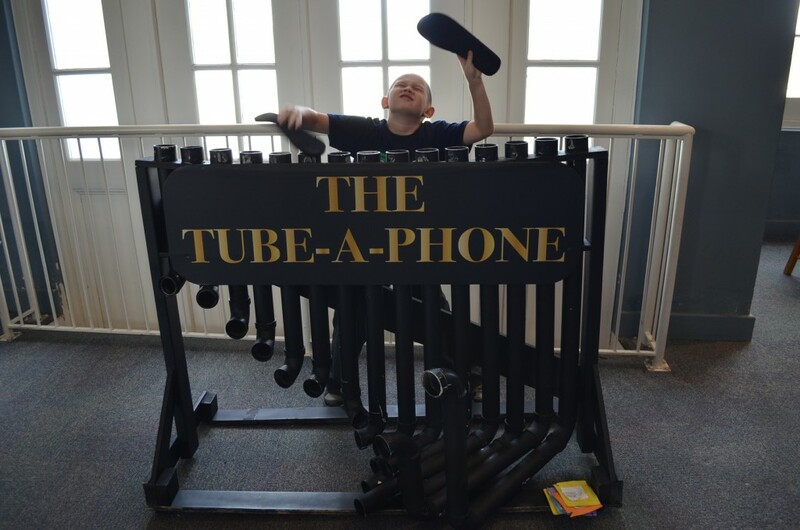 On the last day of the boys’ Spring Break, we took a field trip to Mobile’s Gulf Coast Exploreum Science Center. I went in thinking it would be an all-day museum, but we ended up not spending much time there at all. The kids enjoyed it, but there seemed to be a lot of empty space in a seemingly very large building. It wasn’t crowded at all while we were there, our school district seemed to be the only ones in the Gulf Coast region having Spring Break as early as the college kids…. There’s an IMAX theater at the museum, which was showing Fighter Pilot. We saw Fighter Pilot at the IMAX theater at the Museum of Naval Aviation on one of our multiple trips, so we didn’t see it again. 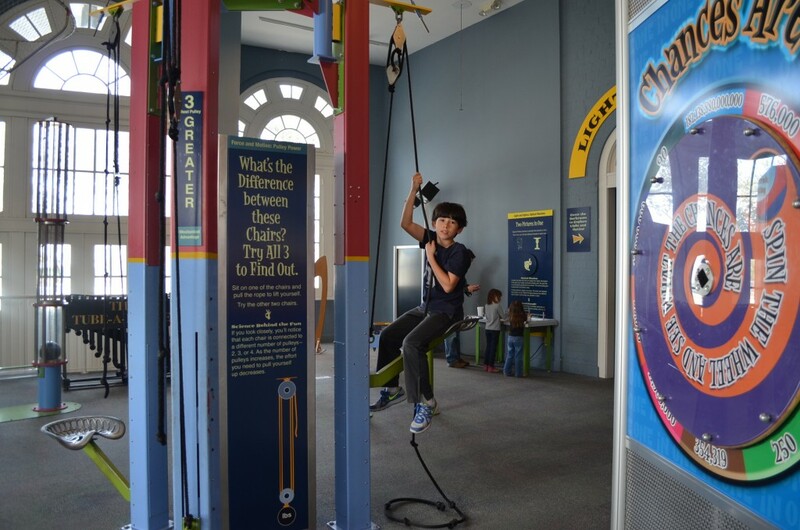 Thanks to our military ID cards, we got an outstanding discount at the Exploreum: my admission was free (even as a Reservist) and the kids’ admissions were each $2 off. The Scratch Factory exhibit was my motivation for taking the kids in the first place. I don’t know if it was good or bad, but I found that most of the Scratch Factory were tasks similar to what we saw at the Pensacola MESS Hall last summer. 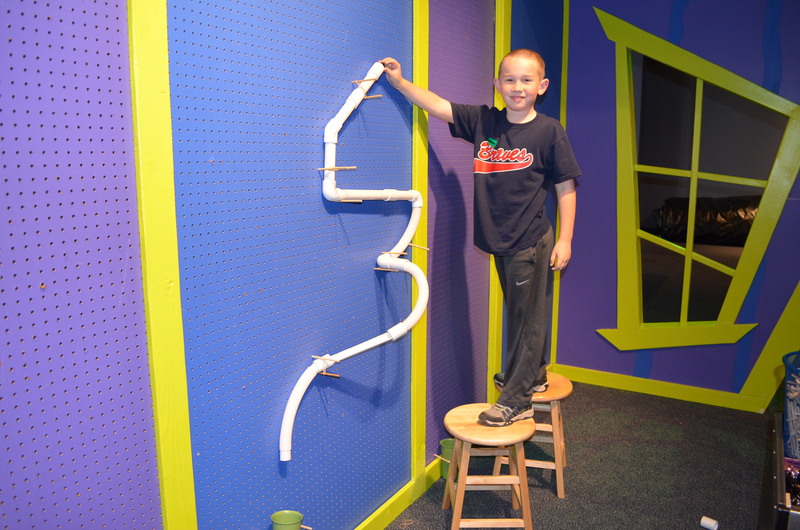 Wind tunnels, crafts that can be run through the wind tunnels, and a giant marble run wall. 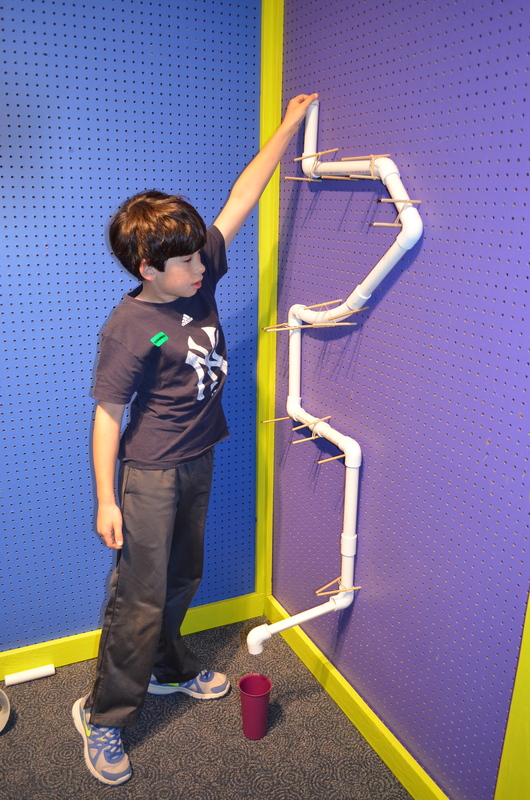 My boys spent most of their time in the Scratch Factory area enjoying the marble run construction area. Timmy’s “So Tall I Need a Stool” marble run. He wanted to make sure I could capture the three dimensions in his creation. “Like Aquaduck“, he told me. We didn’t spend long in the Scratch Factory section. Thankfully, it was quite empty most of our time there, and a school field trip came in just as we were leaving the area. The next section we explored was the BodyWorks section. This was a very good assortment of medical and health-related exhibits. You started by receiving a blank key-card with which you would insert the card into assorted physical tasks and the card would record data about the tasks. There were plenty of signs around attesting that the data on the cards was not kept for any reason, and the cards were erased upon their return. There was a scale, numerous strength measurement tasks (arm wrestling, hitting a hammer to ring a bell, etc), and a few mental agility tasks. If you went around the entire exhibit, then returned the card to the beginning, this assessment would print out for you. Unfortunately, many of the assessment displays were broken. The medical profession exhibits were really cool. 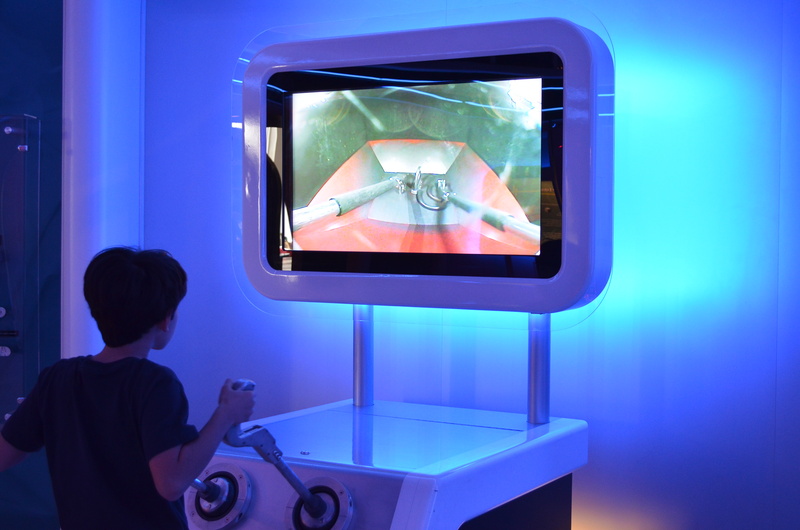 The kids could explore what it’s like to do heart surgery, endoscopic surgery, and explore tools that surgeons uses. Jacob explores how doctors perform endoscopic surgeries. He had to rely on the camera as his “eyes” to thread one piece of metal through another all inside that box in front of him. There’s also a BeHealthy exhibit, which featured making correct grocery shopping and eating choices. I remember a similar exhibit at the Omaha Children’s Museum. After a lunch break back at the truck (we packed leftover beef and broccoli stir fry) we headed back in to see the last large section, which was called the Hand’s On Hall. This was full of a wide variety of explorations: sound, light and physics displays. Like at the BodyWorks section, many of the exhibits showed signs of wear and some of them outright didn’t work at all. Jacob learns about the impacts of 2-, 3-, and 4-pulley systems. You sit in a seat and use the systems to hoist yourself up. The more pulleys in the system, the easier it is to do, but you lift yourself more slowly. My rock star. Pieces of PVC pipe and a pair of cheap flip flops. I could totally do this at home! We spent a total of 3 hours in the museum if you include time at the really nice gift shop. After the museum we walked next door to the Fort Conde Visitor’s Center, which just opened last October. This area has a 4/5-scale reproduction of the original fort that sat on the same site. Fort Conde helped protect Mobile and Mobile Bay in the early 1700s. Tucked in among the more modern Mobile skyline, it’s a very short walk around the perimeter. 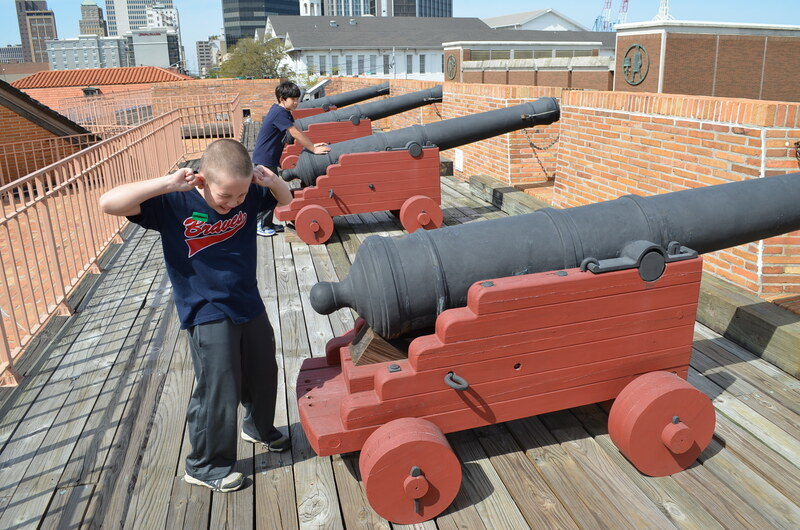 Timmy said “Let’s pretend we’re bombing!” So they did…these are facing Mobile Bay. 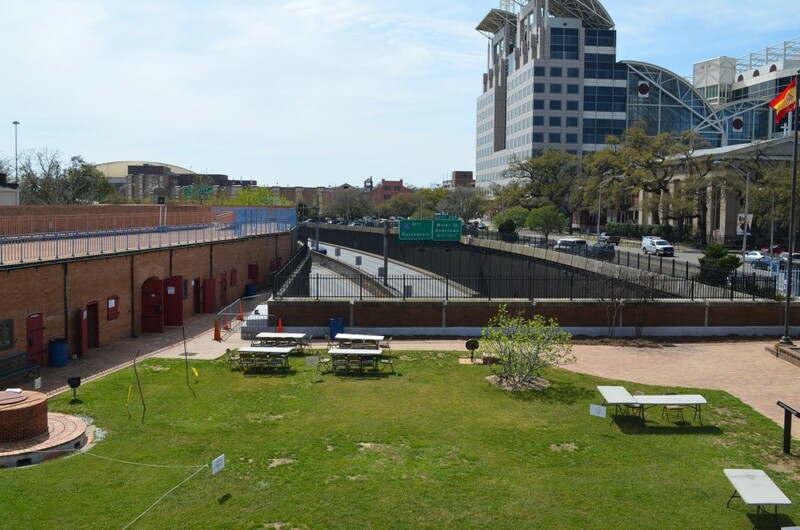 If you’ve ever driven through the I-10 tunnel (called the George C. Wallace Tunnel…shudder), you will have driven right under Fort Conde. It’s just above the western end of the tunnel. The boys and I had a fun field trip and it was a nice way to wrap up their Spring Break this year.